Patients are scheduled and seen by appointment. We value your time and we do our very best to accommodate your schedule. Appointments in our Coeur d'Alene office for you or a family member can be made by calling or texting (208) 762-2544. You may also send an email inquiry and we will do our best to contact you back immediately. Our dentist and her hygienists want to be available for you and your family's needs, along with the needs of all our patients. When a patient does not show for a scheduled appointment, a patient from another family loses an opportunity to be seen by the dentist. This is why we request at least 24 hours advance notice of cancellation. We understand there may be rare occasions of unexpected illness or injury where 24 hours' notice is not possible, but in all other instances we ask our patients to make their dentist appointment a priority and to call well in advance of any cancellation. Thank you! 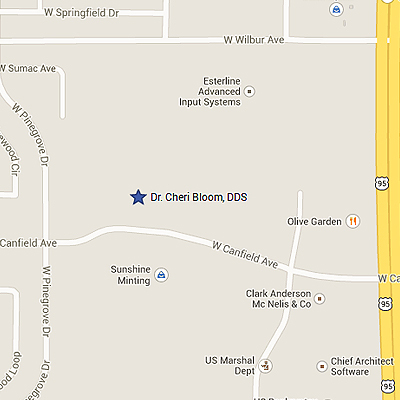 Dr. Bloom's office strives to provide the very best quality, affordable family dental care and exceptional customer service in a beautiful, conveniently located office in Coeur d'Alene, North Idaho by a highly trained dentist and a very experienced support team.